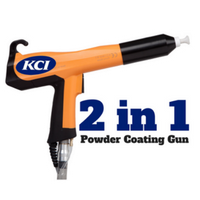 Introducing the K1R-6 all-in-one powder coating gun from KCI. 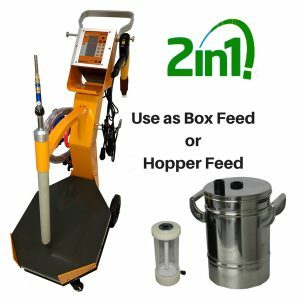 The incredible powder coating gun that can be used as both a box fed gun and a hopper fed gun. 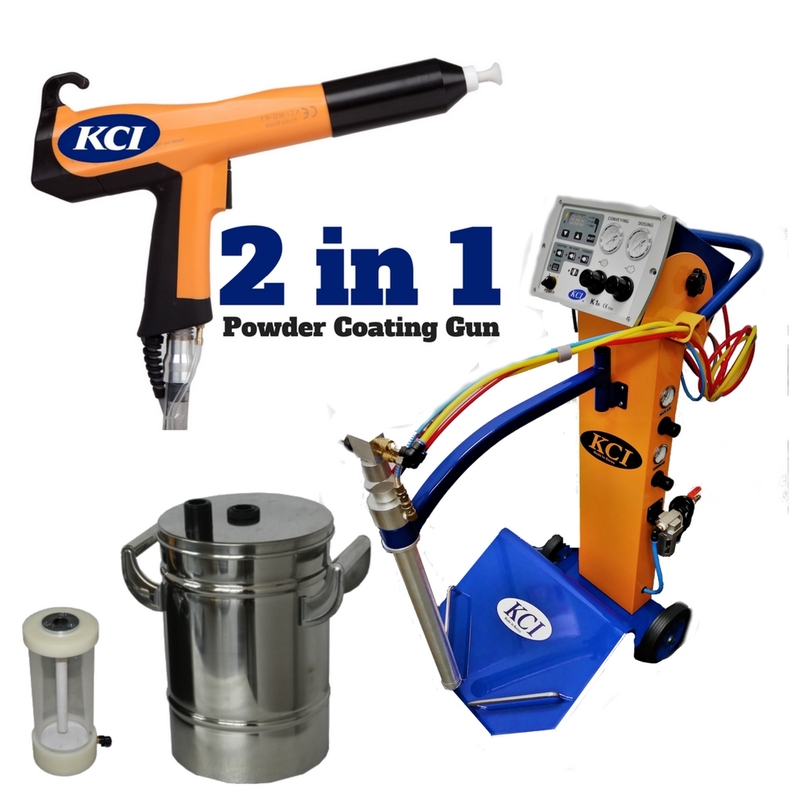 Literally two guns in one, the K1R-6 is the perfect setup for the small to medium sized powder coating shop. From flat work to fenders or machined parts to metallic’ s the K1R-6 can handle any job that comes through your shops door with ease. 1. Remove the powder pump assembly from the box feed stand. 2. Push it into the top of the hopper. 3. Attach the hopper air supply hose from the controller to the hopper. 4. Press the button on the controller and you’re ready to powder. Clean up is fast and easy too thanks to the power clean valve included on every unit. Just press the purge button on the back of the gun, squeeze the trigger and the powder path of the gun will clean itself from the pump to the gun tip. For your shop the K1R-6 means years of worry free service and profits and minimizes the need to purchase a backup gun. Backed by our Exclusive 5 year warranty, should your KCI gun ever fail, a simple phone call to us is usually all that’s needed to get you back-up and running fast. With PowderCoatPro and KCI… shipping is always FREE. Our powder coating guns ship fully assembled, palletized and ship shrink-wrapped to your U.S. based business address generally within 24 hours of your order. A loading dock or forklift is required. Shipments to Canada are made through UPS ground and require some assembly. For those businesses without a loading dock or forklift or for shipments to residential addressed, there are two options. (1) We will ship your unit to you free of charge via UPS ground service and you can assemble it (easy and takes 10 minutes) or (2) you can pay for lift gate service (approximately $150.00) and have your unit delivered curbside fully assembled by freight. KCI guns have been causing a stir ever since they hit the streets in back in 1980’s. They were the brainchild of a powder coating factory owner who found himself in a constant battle to keep his guns online and production running back in the earl 80’s. Some say he did it all on his own, others say that he stole a Design Engineer away from Gema to build it for him. Either way, his new design was quickly finished and immediately put to work in his factories. 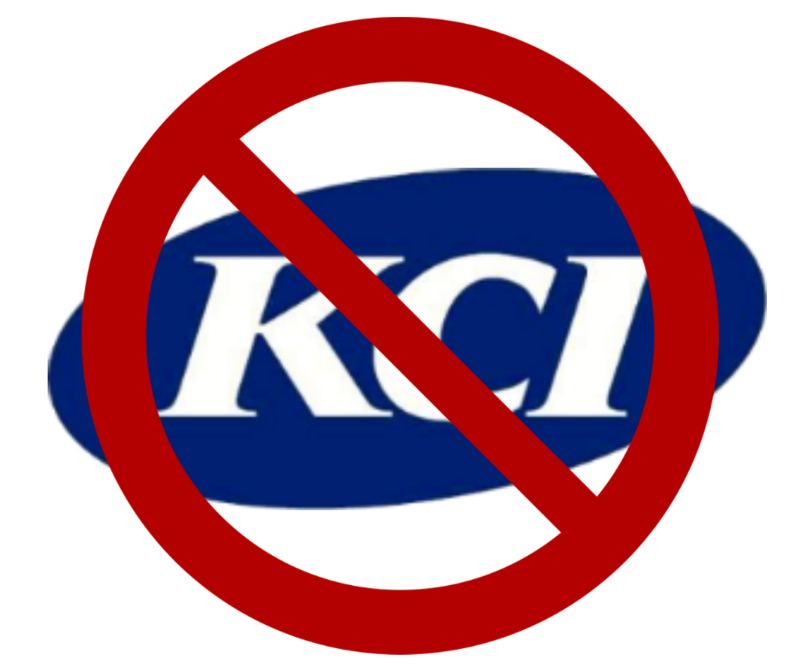 Throughout the 80’s and early 90’s KCI began to capture huge market shares in countries all across Europe and Asia capturing as much as 70% market share in some countries and quickly became a serious threat to the other brand names in the business. In fact at one point one of them tried to buy them out, but the owner declined and KCI has been growing and gaining market share steadily ever since. All prices are USD. Payment in full is required before shipment. Thank you.